Sean Ruppert of Opal LLC, hold depiction of aerial view of Watkins Alley looking Northeast. The large white structure at the top of the rendering is Safeway. The white structure just below it is Frager’s. 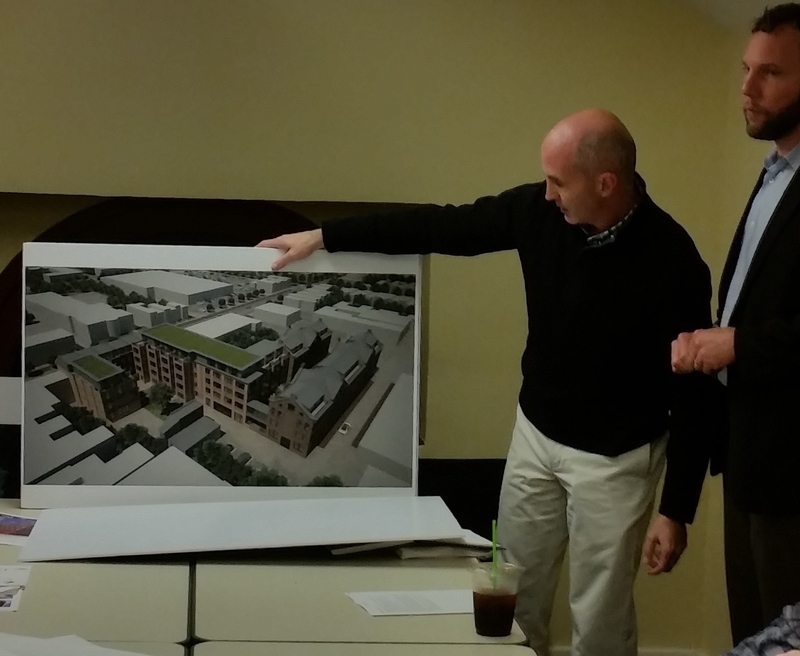 Last night, at a “Special Call” meeting, ANC6b voted 7-0 to support OPaL LLC’s Planned Unit Development (PUD) application for its residential “Watkins Alley” project near the SE Safeway after negotiating a community benefits and amenities package with developer Sean Ruppert. The 43 unit project will include a total of 5 two and three bedroom affordable housing units, 4 of which will be available at 50% of Area Median Income (AMI), and one at 80% of AMI. In addition, the project will include 1 one-level, universal design senior housing unit at the market rate. And a contribution to improvements at Potomac Avenue Metro Station. The project will be built to the new Leeds Silver Standard. Two new benefits which the developer agreed to were a $10,000 improvement to the D Street portion of the fence around Potomac Gardens (done at the request of the residents of Potomac Gardens) and support of the community “Safe Routes” programs which is organizing to improve safety around metro stations in ANC6B. The total value of the benefits and amenities package was estimated by the developer’s architect to be around $250,000. It seemed to be the consensus of the ANC to address concerns raised by nearby neighbors regarding traffic impact and traffic safety issues around the project by working with DDOT to slow traffic and possibly create pedestrian lanes in the alleys around the project. Neighbors suggestion that relocating the garage to where it could be entered from the street was deemed impractical by both the developer and the ANC. note that these developers, unlike Stanton Eastbanc which is developing the Hine School site, are making the interior courtyards accessible to the public. That is a very valuable community benefit too.